We are very proud that we offer an extensive range of orthopaedic services performed by Dr Sally Smith & Dr Josh Dabrowski. Below are some examples of the more complex surgeries we perform here at Doyalson Animal Hospital. Cranial Cruciate Ligament Disease: What is a Tibial Tuberosity Advancement (TTA)? Tibial tuberosity advancement is a surgical procedure designed for the treatment of cranial cruciate ligament (which is known as the ACL ligament in humans) disease in the dog. It involves cutting the tibial tuberosity and advancing it forward so that the patella tendon is perpendicular to the slope of the tibial plateau. This prevents the abnormal sliding motion of the joint, which occurs after the ligament has been damaged. This surgical procedure relieves the pressure on the injured cranial cruciate ligament, stabilises the joint motion and therefore, reduces the inflammation in the joint and slows the progression of arthritis. Your veterinarian will have discussed the diagnosis of ruptured cranial cruciate ligament with you. Radiographs of the stifle (knee joint) and the tibia need to be performed so we can assess the joint and measure the joint angles. As opposed to ACL rupture in humans which is usually a traumatic event; in dogs it is a slow, progressive disease as a result of a malformation of the joint resulting in an increased strain and force on the cranial cruciate ligament throughout life. The TTA procedure is designed to rectify the conformation abnormality and is thus a superior procedure to some of the older techniques used which focus on constructing a new “ligament”. Patellar luxation is one of the most common orthopedic conditions in dogs with the condition affecting primarily small breeds. Patellar luxation (dislocation) is a condition where the patella (knee cap) rides outside or “slips” out of the femoral groove. There are varying grades of it, from mild forms where it may “slip” out every once in a while to severe forms where it may be permanently luxated. If left untreated, over time the joint cartilage can become worn down and arthritis sets in. Other structures in the knee such as the cranial cruciate ligament (ACL) are also potentially put under strain as a result of this condition. As there are a number of factors affecting the mal-alignment of the patella, and so there are various techniques used to correct the problem. Each case is assessed individually and corrective surgery tailored to give the best possible outcome. The prognosis for this surgery is generally very good. Inter-vertebral disc disease (damage/disease of the cartilage between the vertebrae resulting in compression of the spine – i.e. a “slipped disc”) is a very common condition in especially dogs, but also cats. It can present in many forms. Anything from pain ( e.g. yelping when picked up, shivering, diarrhoea, limping on a leg), to varying degrees of reduced function ( e.g. ataxia – reduced ability to control placement of the legs/feet which results in a stumbling/ “drunken” gait) , to more severe symptoms such as paralysis. As a result it can sometimes be a tricky process to get down to the root cause. There are various diagnostic tools one can use to try assess the spine. At Doyalson Animal Hospital we are able to perform myelograms, which is a useful tool to identify inter-vertebral spinal disease (IVDD). 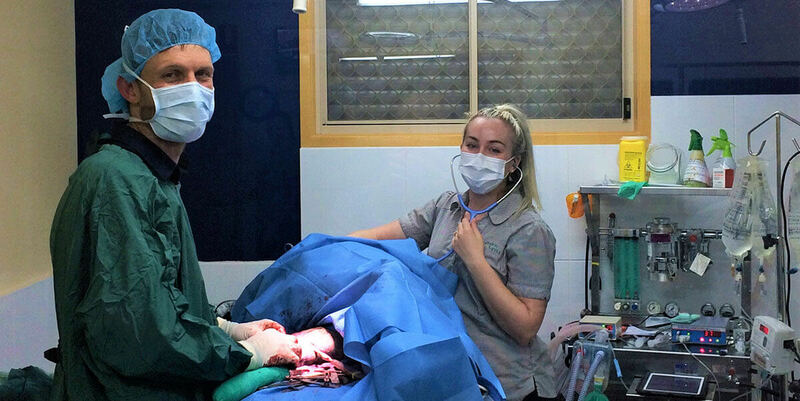 With IVDD; surgery is often the best approach to give one’s pet pain free quality of life. Generally the surgery has a very good prognosis, even for a lot of the more severe cases with complete paralysis. With spinal injury, timing is always of essence and so prompt diagnosis and surgery give a better prognosis, than when the problem is left to drag along. Otitis externa (ear infection) is a very common disease, especially in dogs. It is a painful/uncomfortable condition. As animals express their pain very differently from people, often the signs they show of pain in their ears is scratching their ears/shaking their heads. This can be a very frustrating condition to deal with as it often has underlying triggers (such as an allergy), which make its likelihood for recurrence high. Some dogs struggle with chronic ear infections despite repeated/ongoing treatments. Over time with repeated infections the ear canals often become scarred, and as a result narrowed. Middle ear infections also may develop, especially when there is poor drainage out of the ear canal as it’s so narrowed. As a result, some chronic cases can no longer be adequately managed medically and require surgery. There are a number of procedures we perform to help patients with otitis externa: from re-constructive surgery where we create a shorter, more open ear canal; to a much more aggressive surgery where the ear canal is no longer salvageable where we remove the ear canal and clean out the middle ear. These surgeries can be literally life changing for some patients who are suffering from chronic ear ache. Fractured bones can be difficult to repair, especially when they need precise re-alignment, such as when they occur through a joint. We are equipped, and have the expertise to repair most complex fractures. Soft palate abnormalities should be treated if they cause distress to your pet, become more severe with time, or cause life-threatening obstruction. If your pet shows gagging, coughing, exercise intolerance, or difficulty breathing, resection of the excess soft palate may be necessary.